Access lists of at-risk buildings arranged by address, color-coded, and sorted by each community district. View reports on your computer, phone, or print them out in a clear format to take offline and into the field. Look back at reports from previous months. Navigate directly to a property page on ACRIS, HPD, DOB, DOF tax bills, OASIS map, and Google Maps. 300+ apartments in 9 rent stabilized buildings were sold in Washington Heights/Inwood (Manhattan CB 12) for a total of $75 million. High sales prices can mean the new owner plans to displace existing stabilized tenants to make large profits. The Bronx had the most stabilized buildings with 5 or more new Housing Preservation & Development (HPD) complaints – 930 with more than 11,000 complaints in just December alone. HPD issued 10+ violations most frequently in Brooklyn rent stabilized buildings, more than 4,500 violations total in 260 buildings. Buildings accumulating many HPD complaints or violations in a month can indicate a landlord is actively harassing or neglecting tenants in an effort to push them out of their apartments. 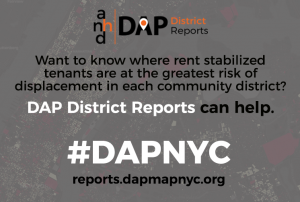 DAP Reports build off ANHD’s interactive data visualization DAP Map, which was launched last year, taking public data related to housing and presenting it in a more easily accessible way for users to understand where there are heightened risks of displacement in New York City. It compiles fragmented information from various public records and databases, and makes it more easily accessible for advocates - especially organizers and activists - by displaying it in one place, with intuitive, color-coded metrics. 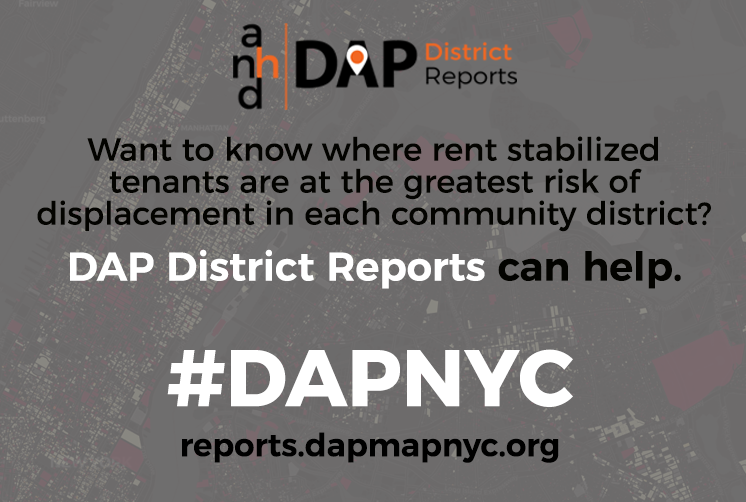 For more information on how to use the DAP District Reports, visit the Tutorial Page. For specific questions or press inquiries, please contact Lucy Block at lucy.b@anhd.org.